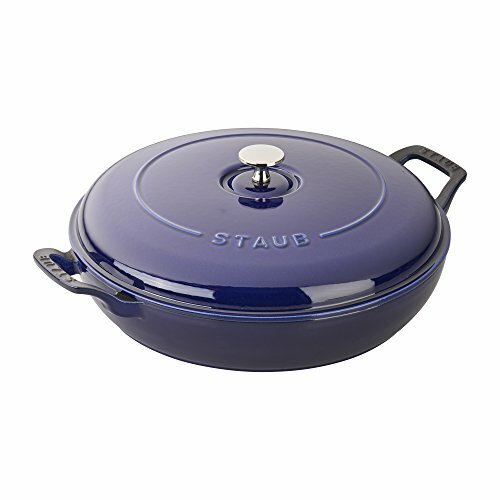 The Staub Cast Iron 3.5-qt Braiser is the perfect pot for one-dish suppers, braised lamb shanks, and breakfast hash. It will quickly become your go-to cooking vessel, perfect for sauteing, frying, braising, and roasting. Thanks to its vivid Majolica enameling - a three-step technique that imbues the color with brilliance and depth - this iconic piece beautifully transitions from oven to table.The domed lid makes it easy to cook large cuts of meat - its heavy weight helps lock in moisture for flavor-enhanced food. The braiser's unique design features vintage look handles that encourage easy maneuvering while wearing oven mitts.